1. Cut about a 20 inch long section of the crepe paper. Use the scissors to split that section into 3 skinny strips of 20 inch long crepe paper. 2. 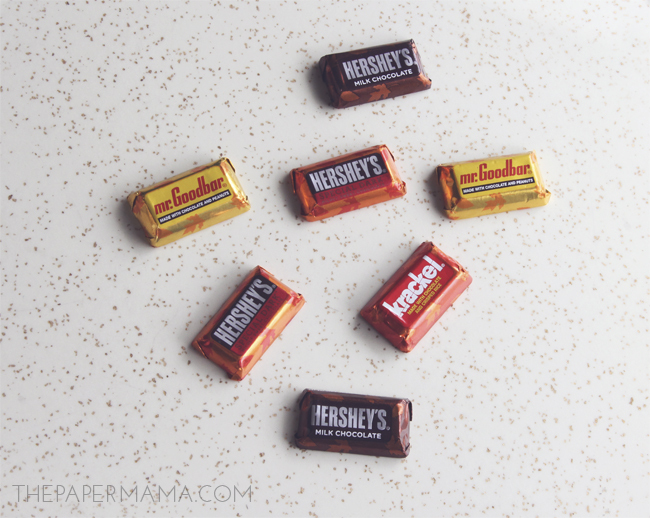 Grab a piece of Hershey’s Dish Candy and glue one end of the crepe paper to the back of your candy piece. 3. Wrap, wrap, and wrap that little paper until the crepe strip is completely wrapped around the candy. Glue the end of the crepe paper on the back of the candy. 4. 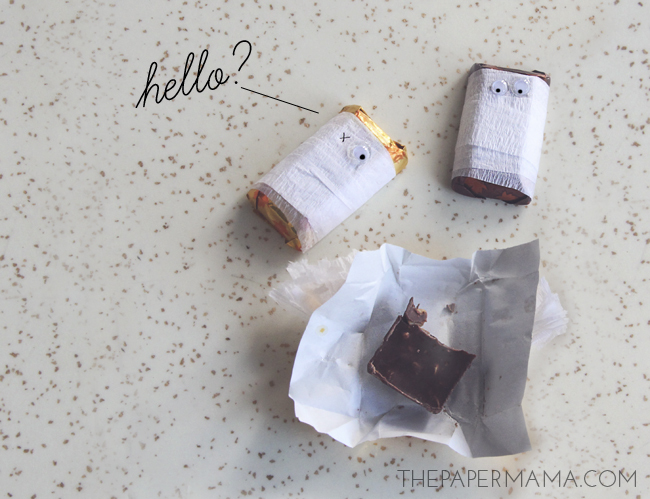 Grab a couple googly eyes and glue them on the front of your Mummy Candies. You could also glue one eye and place an “x” in place of the other eye. Poor guy lost an eye. 5. Hand these guys our to your trick or treaters! I recommend sneaking a few and eating them yourself. Ha! I’ve been working so much lately, plus doing mama stuff, it’s been hard for me to take some time for myself. I get most of my work done when the kiddo is in bed, which means I forget to just chill out. Drawing is usually one of my favorite ways to just sit and relax, but I’m talking about REALLY unwinding. No creating. Just sitting and relaxing. The best way for me to truly relax is to do some reading, like a PEOPLE Magazine. Add some chocolate and wine, perfect. 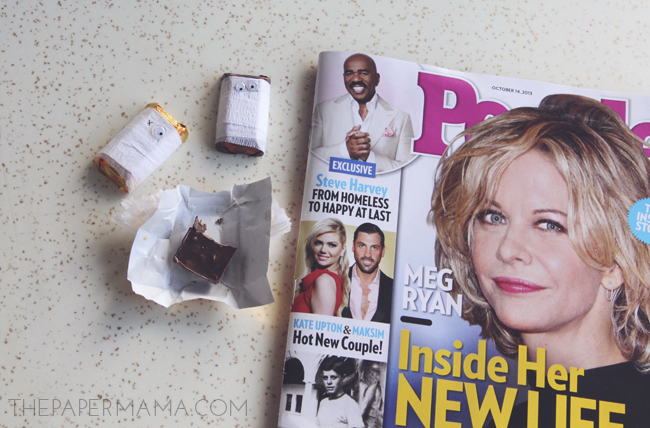 Since Halloween is just around the corner… adding some chocolate to my relaxing has been happening A LOT. Cause: chocolate. I’ve gotten really good at sneaking pieces of candy without my kiddo seeing. Ha! Halloween is dangerous for me. So much candy. 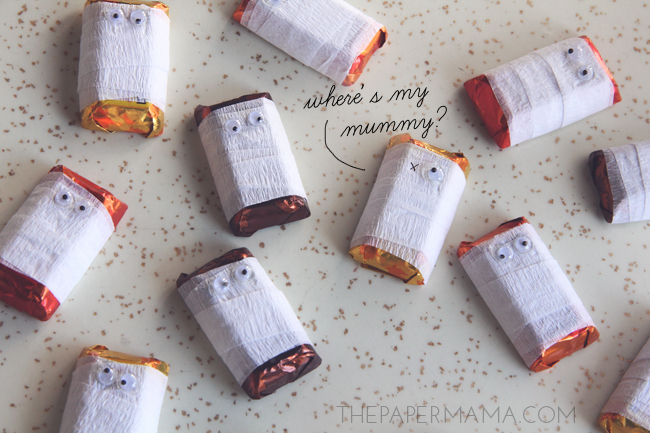 I really need to make some more mummies… since I ate most of these guys I made for the trick or treaters! Ha! Whoops. Side note: I used a Target coupon to buy my candy and magazine. I know you’ll be buying candy soon, so here’s a link to the coupon (while supplies last). This post was sponsored by PEOPLE Magazine, Hershey’s Dish Candy, and Target. I was paid for this post and all opinions are my own. These are so adorable! Love them. How cute! This is totally something I could do with my daughter for her Halloween class party!